Location – Building #3 – UP – D2 & E2 PLEASE READ THE. WE DO NOT GUARANTEE ANY SPECIFIC APPLICATION FOR PARTS OR TECHNICAL LITERATURE. 100% Complete / New. 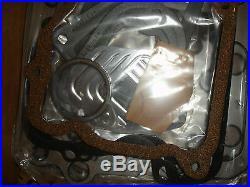 This sale is for One COMPLETE Cummins UPPER Engine Complete Gasket – A Full Upper Set. A limited number of these. 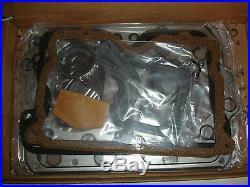 100% factory NEW, sealed in the factory box – A BRAND NEW part. These are straight off of the shelf of the US Gov’t. We presume these are OEM Cummins, but they could be Federal-Mogul or Interstate McBee – We have no way to confirm either way. 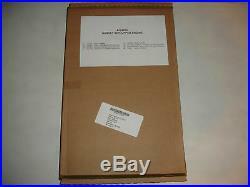 They are in generic looking boxes which is very common with goods produced for the US Government. The NSN information that accompanied them is included in the listing. 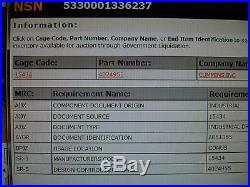 The manufacturers code in the NSN information is 15434 which = Cummins, Inc. Either way, a quality part. 100% Unused in any fashion – plastic sealed in the manufacturers box. 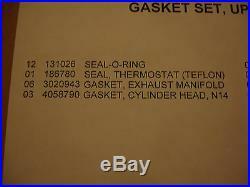 GASKET SET – UPPER 8 separate part numbers (from the box contents label) – sealed in the factory plastic Content: (Part Number – Description – X Quantity) 131026 – Seal-O-Ring X 12 EA 156545 – Seal-O-Ring X 3 EA 186780 – Seal, Thermostat (Teflon) X 1 EA 3017750 – Gasket, Rocker Lever Housing X 3 EA 3024709 – Ring, Seal, SQR Cut, Water MAN X 6 EA 3020943 – Gasket, Exhaust Manifold X 6 EA 4058790 – Gasket – Cylinder Head, N14 X 3 EA 70624 – Seal-O-Ring X 4 EA. IMPORTANT: This kit is applicable to select, but not all, Cummins engine configurations. Engine specific based on CPL / engine code. You must use your 8-digit engine code to confirm your specific application with a knowledgeable source (dealer / reputable service center). Not us here – We cant help you any further than the info in the listing. We simply have no specific application charts to consult. Please look at the photos, the description and the factory part number(s) provided to see if it is correct for your application. The kit, as a whole, has a part number, as well as the individual pieces have part numbers listed too. We sell things just one time. These are new, sealed in the box kits. You must practice due diligence and confirm the part number with your specific needs. DESCRIPTION FROM WB PARTS. 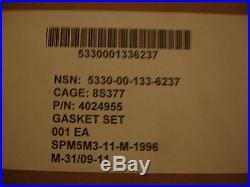 See also GASKET ASSORTMENT. 3804272 15434 CUMMINS INC. 4024955 15434 CUMMINS INC. A ETABLISSEMENT CENTRALD’APPROVISIONNEMENT DES AR51365 15434 CUMMINS INC. DESCRIPTION FROM OSHKOSH EQUIPMENT SALES. 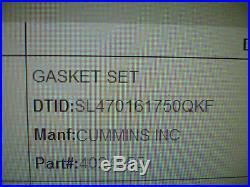 Top End Gasket Set for Cummins NHC-250 Diesel Engine. Used on M809 and M939 Series 5-Ton 6×6 Military Vehicles. Does not fit M939A2 Trucks with 8.3CTA Diesel Engine. DESCRIPTION FROM EASTERN SURPLUS & EQUIPMENT. Includes exactly what is pictured in the listing photos. 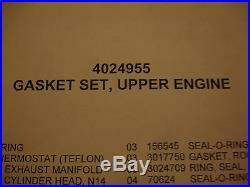 1 Complete upper gasket set (Part Number 4024955). No more, no less. If you don’t see it in the pictures, then it is not included in this sale. A fraction of Dealer list price. A finite number of these – When they’re gone, they’re gone. We honestly have no additional application information to provide you with. At the end of the day they are all just pictures, part numbers and prices to us. You can ask us all day long and still get the same bewildered answer – Sorry! Any additional information will have to come from the dealer or a more knowledgeable source using the part number and the photos provided. Folks – We have been doing this for a L – O – N – G time (in business almost 30 years) and spend a great deal of time in the listing and description of each item. Please remember that we don’t use any of the items that we list / sell. We simply describe, to the best of our ability, what is in front of us. Like it or not, in the end they are just part numbers, photos and prices to us. If an item is new, we will simply tell you just that. Please remember some of the items we sell are unique and condition is obviously subjective. We try to be very conservative in our representation of items. It’s actually harder to sell a used item than a new one because we have to describe the difference. We don’t try to misrepresent anything – No surprises are a good thing – We do our best to help you. Confirm your application using the part numbers, descriptions and photos provided. We just sell things one time. We want happy folks – It’s just good business. This is how my family makes its living – WE VERY MUCH APPRECIATE YOUR BUSINESS! 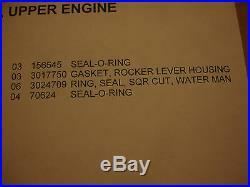 The item “NEW Sealed Box Cummins UPPER Top Diesel Engine Gasket Complete Set Kit 4024955″ is in sale since Thursday, June 14, 2018. 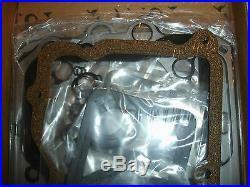 This item is in the category “eBay Motors\Parts & Accessories\Car & Truck Parts\Gaskets\Full Set Gaskets”. The seller is “m2c2justlookin” and is located in Westerville, Ohio. This item can be shipped to United States, Canada, United Kingdom, Denmark, Romania, Slovakia, Bulgaria, Czech republic, Finland, Hungary, Latvia, Lithuania, Malta, Estonia, Australia, Greece, Portugal, Cyprus, Slovenia, Japan, China, Sweden, South Korea, Indonesia, Taiwan, Thailand, Belgium, France, Hong Kong, Ireland, Netherlands, Poland, Spain, Italy, Germany, Austria, Bahamas, Israel, Mexico, New Zealand, Philippines, Singapore, Switzerland, Norway, Saudi arabia, Ukraine, United arab emirates, Qatar, Kuwait, Bahrain, Croatia, Malaysia, Brazil, Chile, Colombia, Costa rica, Dominican republic, Panama, Trinidad and tobago, Guatemala, El salvador, Honduras, Jamaica, Viet nam. This entry was posted on Wednesday, March 6th, 2019 at 4:05 pm	and is filed under sealed. You can follow any responses to this entry through the RSS 2.0 feed. Both comments and pings are currently closed.